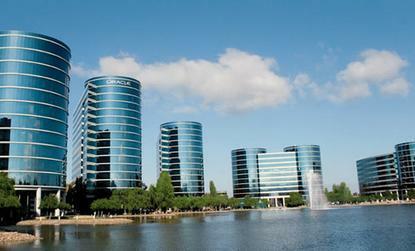 Oracle headquarters in Silicon Valley. Companies using Oracle's namesake database may soon have the option of choosing a new license that offers flat-rate pricing for unlimited use of the product in perpetuity, according to a recent report, and at least one consultant confirms the news. "We have seen them in the wild," said Craig Guarente, co-founder and CEO of Palisade Compliance, which helps Oracle customers negotiate with the database giant. "It's not a rumor -- Oracle is putting that in front of customers." Oracle has long offered what it calls its Unlimited License Agreement, which spans a limited time -- typically three or four years. At the end of that time, customers must certify their usage to Oracle and pay for anything extra that got used along the way. Customers have made no secret of their dissatisfaction with Oracle's licensing tactics. Just last week, it was reported that the U.K. government is working to end its reliance on Oracle software. The new license could also give customers the ability to transform expenditures on Oracle's software from a capital expense to an operational one, much the way the increasingly popular software-as-a-service (SaaS) world has. Because the PULA licenses are still new, they're likely highly negotiated, and Oracle is probably still tweaking the requirements, Guarente said. So, one company's PULA would probably look different from another's, he suggested. "They're expensive," Guarente added. "It's not a way to spend less with Oracle. I would caution people not to think this is unlimited forever, with no restrictions." Overall, "I think it is an effort to lock out competitors," he said. Oracle "must be seeing more of a threat from competitors who are easier to deal with, including open source providers such as Postgres," agreed Frank Scavo, president of Strativa. In fact, according to The Register's report, the new PULA requires that the customer commit to using Oracle's software over competing products. "I seriously doubt that Oracle will be able to enforce any terms and conditions that call for a customer not to use a competing product," Scavo said. "That might border on restraint of trade, in my opinion." Indeed, "I would be shocked if that was in the contract," Guarente agreed. "That would be problematic." Of course, "if you're paying any vendor to use their products, why would you use a competing product?" he added. "It looks like a good move by Oracle," agreed Duncan Jones, a vice president at Forrester Research. "It can't fix its obsolete commercial model, but it can help some customers work around it -- if they spend some money." The risk for customers is that "it's probably a 'till death do us part' deal," Jones added, "so check the prenup before you say 'I do.'"